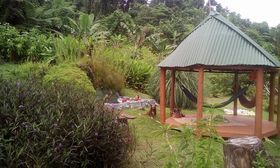 the waterfall in the garden pool or relax in the hammock and listen to the birds. and explain the different root crops, vegetables, fruits and medical plants. You can go with Bobo to the village, meet the people of Rukuruku and visit the school....everybody will be happy to see you.....there is no charge .....a small donation for the school would be appreciated....no new photos yet due to the stage of the village and school after the big hit of Hurricane Winston. 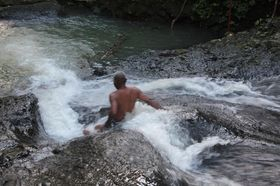 Trek with Bobo to the waterslides "Na Vu Wai"
and enjoy the fresh water pool. free of charge for our house guests. 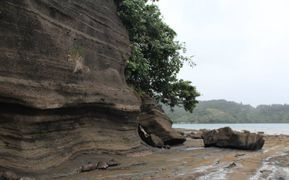 with view of very old vesi trees. meet the local fisher men and women. free of charges for house guests.